I was wondering if this can show a map to us after the user submits the form? I looked into Geolocation widget, and it only shows me the coordinates once the user submits the form. 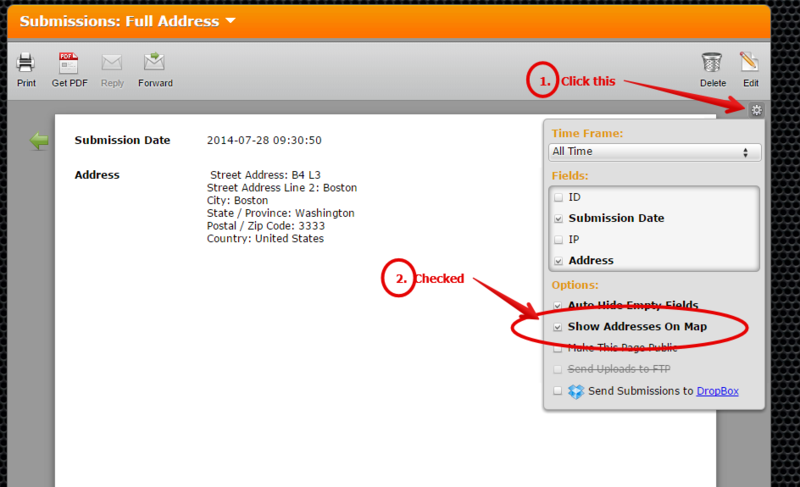 We would like to have a map of where the user dropped the pin after he/she submits a form. you can enable the option "Show Addresses on Map" and it should reveal a visual map of the correct address provided in the address field. My maps are automatically showing up in New York when they are supposed to show in our home town. Any ideas how I can fix this? Please make a new thread about your issue, we just answered one question per thread only. I would like to use this "Show address on map" feature, but when I look at the options, it's not a choice for me to select. Does it actually have to have the official address field on the form for it to show this option?